Officity is a project of Nectil, a european company based in Brussels. Officity is a web platform to prototype, create, expand, share, and publish web applications. 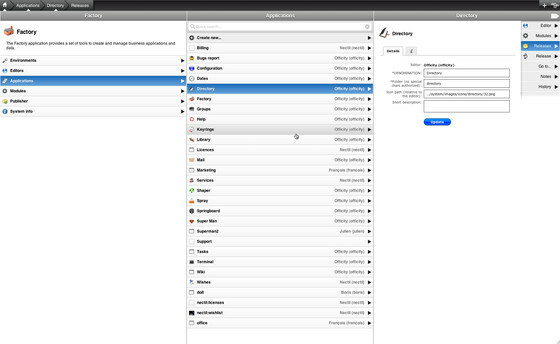 For users, Officity is like Access or Filemaker but on the web. You can create, expand, and share web applications directly from your Excel files and manage your data right away. For developers, Officity is like Windows or Mac OS but on the web. You can instantly prototype and quickly create sophisticated web applications based on the most widespread open-source knowledges (php, jquery) and servers (linux, apache). Choosing Officity, it's choosing for the richness of all its components Kaiten, Sushee, and Shoyu. But Officity is more than the sum of its parts! With Officity, you can create new objects, link them together, and start managing your data within minutes. If you want to extend or customize your applications, Officity provides you existing components to accelerate all your developments. From the smallest component (e.g. create an input field with internationalized label, tip, help, data validator, option list, … with a single line of code) to complete panels (e.g. advanced search p screen, history of an element, link panel, …). 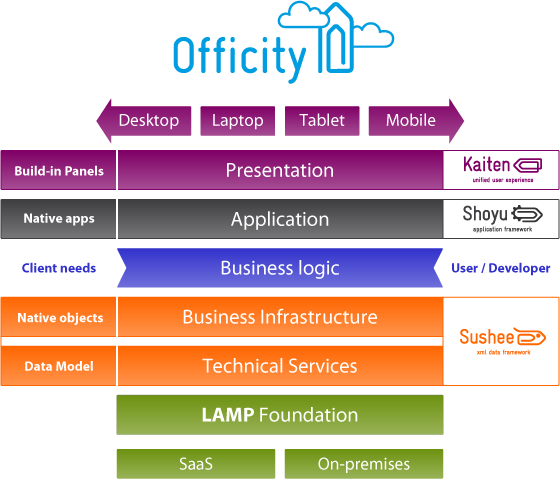 Officity is based on a xLAMP infrastructure: XML, Linux, Apache, MySQL, and PHP. 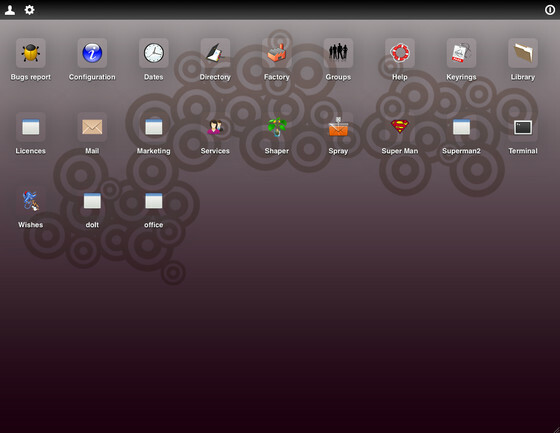 Sushee is a management system for functional and relational business objects represented and manipulated by XML. Kaiten is a jQuery plugin that delivers a new navigation model for web applications. Kaiten can be used in Officity for your web applications or in standalone version for your user interfaces. Shoyu is a library of functional and interface components to quickly build Officity applications.